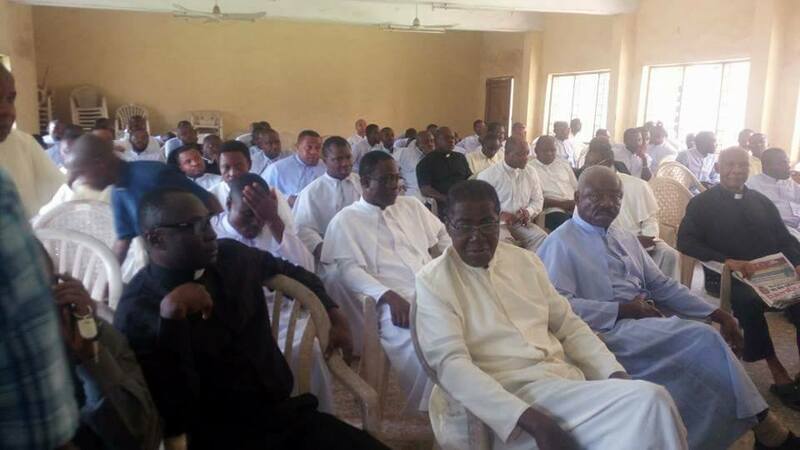 Catholicism in the Eastern parts of Nigeria is not all about going to catholic church. Its about the people and the locals. And in Mbaise, were yours truly is from, catholic is for the people and not even Pontiff's decision can swear the people. 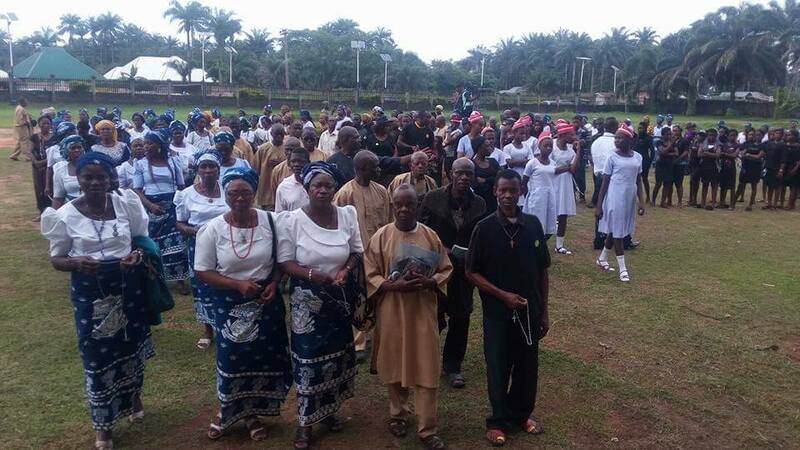 For sometime now, there has been tension in Mbaise over the issue of making Ebele okpaleke Bishop and the people have vehemently rejected that call from the Pontiff. 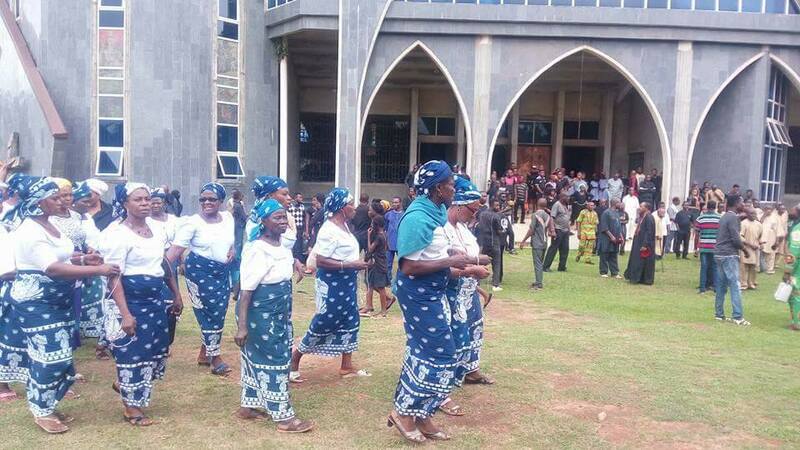 Yesterday's tension at the Ahiara Catholic Diocese in Ahiazu Mbaise Council Area of Imo state as the planned public protest and procession by the laity council over the appointment of Peter Ebele Okpalaeke as the Bishop of the diocese was aborted by the heavy presence of armed policemen and other security agencies who were stationed at all strategic junctions leading to the diocese. 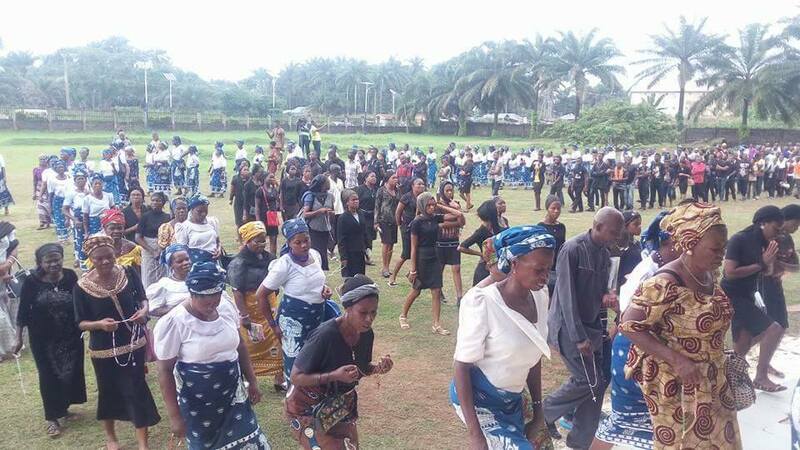 Over 3, 000 faithful of Ahiara Diocese of the Catholic Church converged on the Mater Ecclesiae cathedral, Mbaise in Imo State for a rally to restate their total rejection of the embattled Bishop Peter Ebele Okpaleke. Okpaleke was anointed and consecrated bishop of the diocese by Pope Benedict XVI in 2012 but both the Laity Council and the priests in the diocese rejected his appointed on the grounds that he is not an indigene of the area, among other reasons. The angry faithful of the diocese said they were only fighting alleged imposition of a bishop on the diocese and not the Catholic Pontiff. 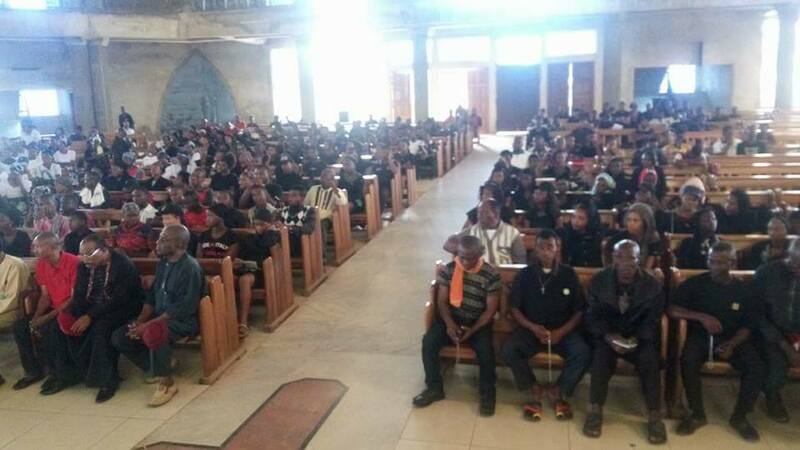 The diocesan youths, who put on black attire, chanted solidarity songs to reaffirm their support for the position taken by the Ahiara Diocese clerics and the laity council’s to rejection of Okpaleke. Other Catholic men and women who dressed in different church uniforms, also participated in the rally, which started with a rosary procession round the cathedral. 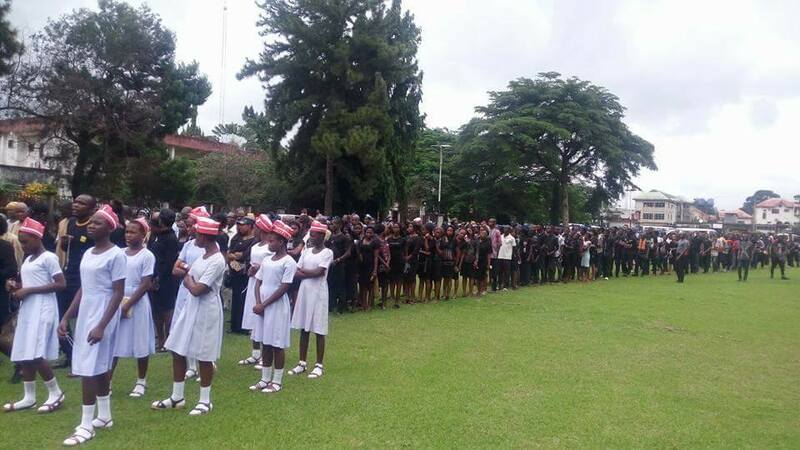 The Imo State Governor, Rochas Okorocha has appealed for calm, urging the priests and laity of the diocese to find a way to resolve the issue. Below is the press release from the state governor. 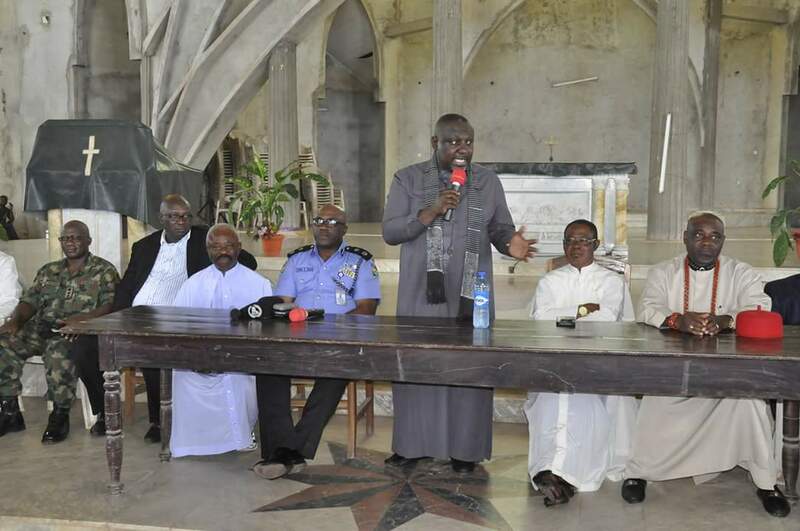 The Governor, Owelle Rochas Okorocha, weekend, met with Priests and Laity in the Ahiara Catholic Diocese, Mbaise and explained to them the need to obey the directive of the Pope by accepting Bishop Peter Okpaleke as the Bishop of the Diocese. The governor who met with the Priests and Laity at the headquarters of the Diocese told them that the decision of the Pope was binding on them and regretted that the Priests were in the forefront of the agitation adding too that the Church would become an object of mockery if the crisis ends the way the Priests and Laity in the Diocese want it to end. His word, “I’m here in Ahiara Mbaise Diocese to bring peace. I’ve been meeting with the priests of this Diocese for over one hour now. And the meeting is all about peace, peace, peace. Peace is very expensive and the bible says to us, pursue peace and not walk towards peace because peace is a very very expensive commodity, but there can be no peace without justice”. He said “I am a catholic, and I’m also the governor of Imo State. I’ve come here to see my people. And address you on the burning issues affecting this Diocese. But I wish you can listen to me attentively so that you can go home with something. I’ve had meeting with all the Priests. I’ve listened to their anger, their grievances and I’m aware of all the historical backgrounds following this agitation. But the moment we are now is a very bad moment. There are so many agitations, so many crises here and there and it looks like Satan has relocated his headquarters to Nigeria. But by the grace of God, we shall fight and destroy these satanic forces”. Hear him, “We’re talking about Ahiara Diocese, IPOB, Boko Haram, Kidnapping, Niger Delta etc. but the one that touches me so much is the crisis of Ahiara Diocese because this touches the fabrics of our faith. First, we’re Christians and you must understand that Christianity is a very difficult religion because Christianity doesn’t preach comfort for us rather, ability to accept persecution. Today, we have a challenge that whatever has made Ahiara a centre of crisis, we must change it for better”. 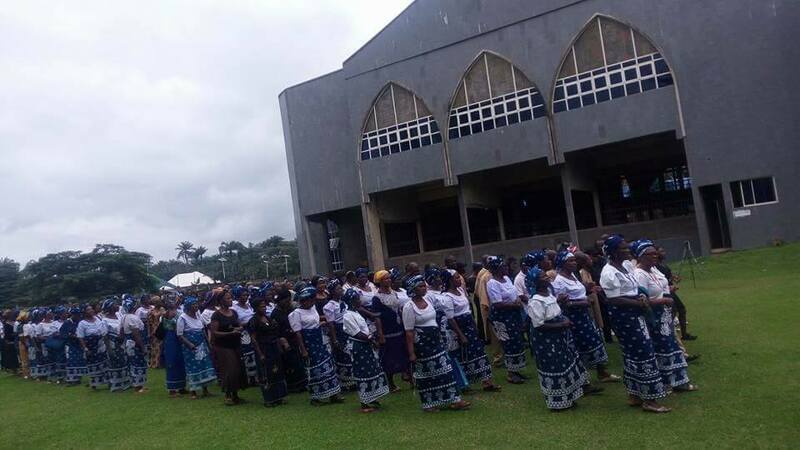 He continued, “Declaration of Biafran War, Ahiara; killing of a steward, Ahiara and now, Diocesan agitation spanning 6years and attracting global focus also Ahiara. We must change the story of Ahiara. I want to state here categorically that since this crisis, I’ve been listening patiently and watching. But I had wished that my advise was taken ab-initio and ipso-facto. If Mbaise must be in the news, it must be in the news for the right reasons. This is because Mbaise is the largest single ethnic group in the South-East and there is no place you will go in this world, without having an Mbaise man, doing well in that region. Mbaise contributes substantially to what makes Imo thick”. He continued “Now listen very well my brothers, what I want to say to you now is for your benefit and betterment. You must know that too much of right can also lead to wrong. Mbaise people have made their point. The whole world has heard you, they have listened to you, any further issue on this matter by Mbaise, might not be spoken the way it had been heard before. Let me tell you the gospel truth of how the world is looking at you now, I don’t know how you will take it after my speech now. But I have spoken like Pontus Pilate, I have come to restore peace in this particular place”. He further remarked “The whole world knows that the Pope has asked all the priests from Mbaise to write a letter of apology to him minus a few of them, to beg the Pope. It might be right, it might be wrong but that’s not the question. But the fact is that before the world, we are no longer enjoying this peace because Mbaise has more priests in the whole of South-East. But sometimes, a wise person behaves foolishly for the sake of his children. So, we must change our style before we deny ourselves of our justice”. “It’s unfortunate that the priests themselves are at the very front of this agitation because the decision of the Pope is binding on them. Please, we must preserve this our priestly order by maintaining the status quo from the papacy. Mbaise must never be seen as a people that disobeyed the Pope and the church”. “Christianity never taught us to be violent rather it’s all about enduring persecution and pains. So, like the priests agreed with me earlier, there must be no room for protest. For now you have done well but don’t overdo it, just leave the stage when the ovation is hot”. “I don’t think any Bishop would like to come to a place where the people don’t want him. You can’t force people to be with somebody they don’t want to stay with. But be careful how you reject people because many atimes, the rejected always turns out to be the best. There should be no more protests. No matter who the Pope sends to you, you must rise up to welcome him if not, the church will become an object of mockery. Because if the Pope takes it the way you want it, the church, the Catholic Church will die”. “I want you to see the possibility that Mbaise sons can also become Bishops elsewhere extending to other states and will be accepted like any other”. The governor added. At the end, Rev. Fr. 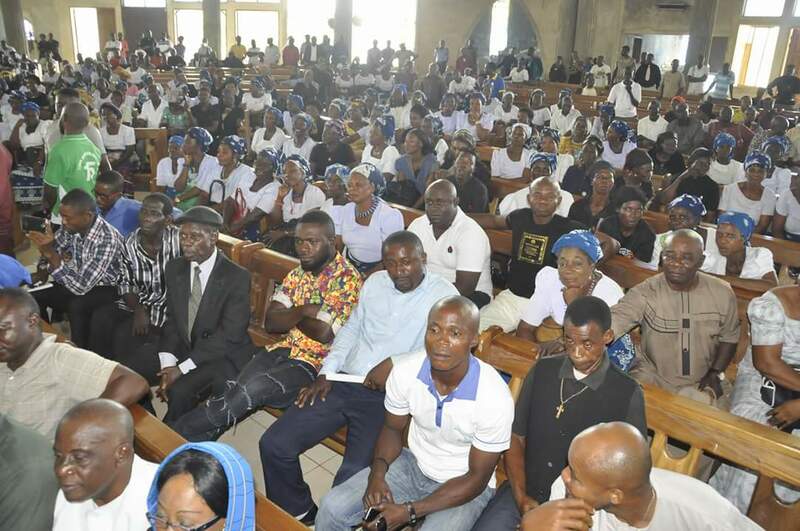 Dr. Joseph Ezeji gave the vote of thanks, pledging allegiance to the papacy, to abide by the decisions of the Pope and confirming that all Mbaise Priests have written their letters of apology to the Pope. He stated that what the people are asking for is for any Bishop groomed from their soil to lead them. He said that the canon law seems to have been bent in the case of Ahiara Diocese. Sam OnwuemeodoChief Press Secretary to the Governor.